Happy Monday! I'm here in the Northeast enjoying another day inside while a lovely layer of ice coats everything outside! Ah, I enjoy winter but this year I've really starting to long for the warmer days of Spring. But while I'm stuck inside I do have a wonderful opportunity to craft and that makes me a happy girl! Today's Keep it Simple card is super easy but created with a fun technique that I demonstrated at a Wholly Scrap! class over the weekend. 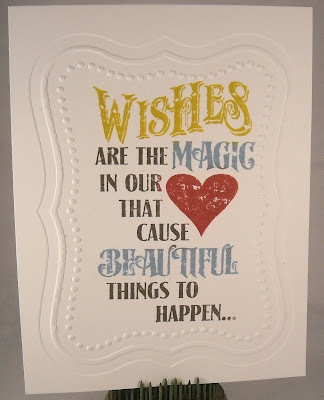 This is a one layer card that I dry embossed with a Cricut embossing folder...don't you love that swirly frame?! 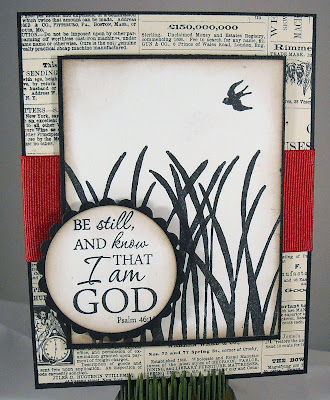 The stamp is from Tim Holtz. Now we all know how to create different colors on an image, right? You use makers to color on the rubber and then stamp. Well not this time! On this card I created my own custom ink pad! 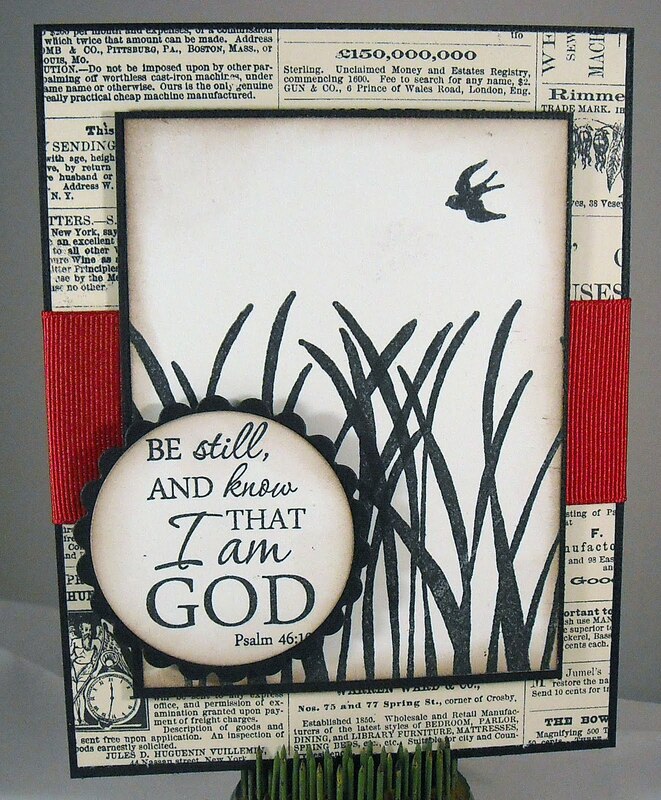 Using Cut 'n Dry Stamp Pad Foam and Distress Reinkers, you can create your own ink pad with your own custom colors. You can even create a rainbow ink pad! And it's super easy to do! Step 1: Stamp your image, using Archival Ink (this is very important! ), on the stamp foam Step 2: Cut the image out of the foam Step 3: Use the reinkers to 'color' the image. The fun thing about the reinkers is that the colors, even though they're right next to each other, won't run! Step 4: Use your new ink pad to ink your rubber stamp and stamp on cardstock! Step 5: Store your new ink pad in a plastic bag. Be sure to stamp the image on a scrap piece of paper and attach to the outside of your bag for reference. The one thing I did notice about making these ink pads is that over time it's difficult to see the details of your original stamped image. However, the ink will not spread beyond where you placed it so the shape of the image will remain, allowing you to easily line up your stamp again (so the individual colors will line up correctly). You should be able to use your new ink pad for at least 40 stamps before needing to reink. Cool, huh? 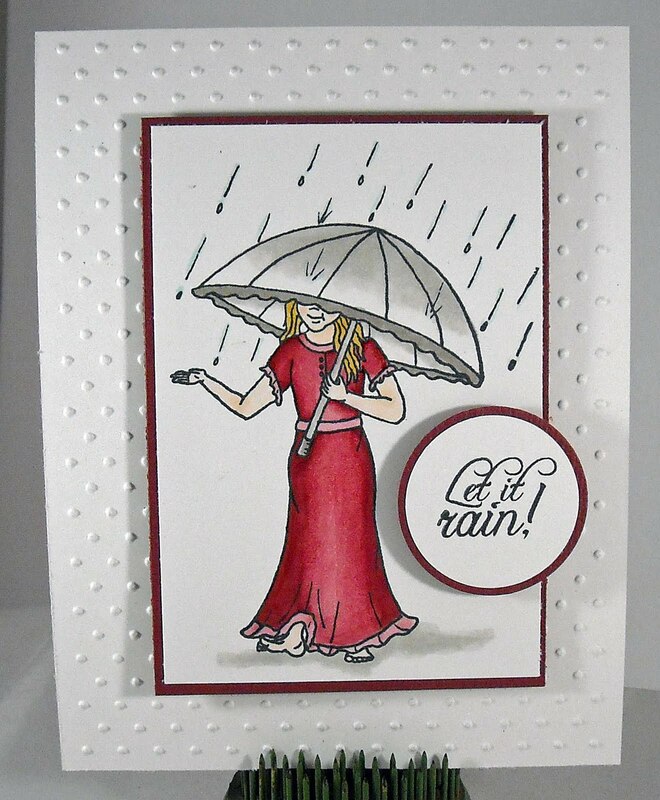 The card I created here also uses the same stamp pad technique. Enjoy today's card and be sure to check back tomorrow when the Sweet 'n Sassy design team will introduce March's new release!! 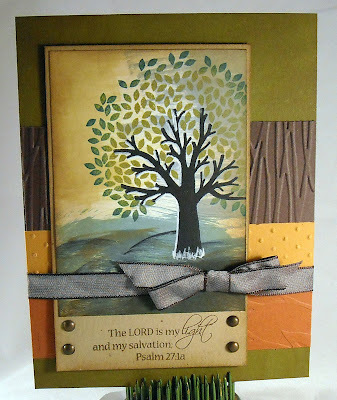 I have a card featured on the Sweet 'n Sassy blog this morning! Check it out here and enjoy! Morning bloggers! Well I'm finding my way around my new computer but it's so darn high tech that it took me a few minutes to figure out how to edit a photo this morning! I'm still not sure I know what I'm doing but I managed to do the basic editing on today's card. ;-) This is a card that I'll be demonstrating at a Wholly Scrap! class this weekend. During the class, I'll be showing the attendees how to create your own custom ink pad, complete with different colors, which enables you to add color where you want to a stamp without using markers to color on the rubber. 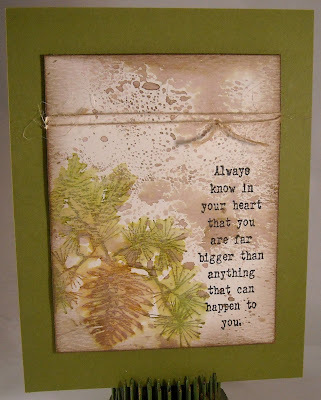 This card features a lovely pine cone image and sentiment from Tim Holtz. 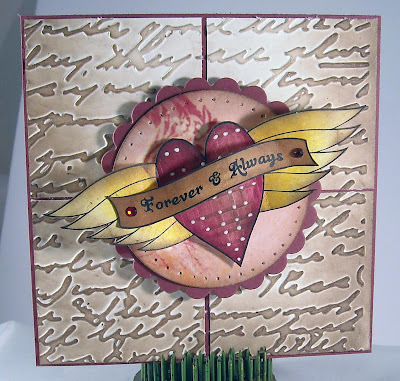 To create the faux watercolor look, I first stamped the pine cone image in the corner of my card. Once the image was stamped, I used a mister to spray the image with water. Since I used Distress Inks (not waterproof!) they easily ran. I also used watercolor paper so that the ink wouldn't run too much and the paper wouldn't fall apart. I then spritzed the background of the card with more ink and water before adding the sentiment. This is a perfect CAS card, as I only attached the watercolor paper to a piece of cardstock and added a bit of twine. Fun stuff! Greetings Bloggers! My apologizes for no post yesterday...seems my computer decided to die a slow and agonizing (well, I think it was only agonizing for me) death on Sunday evening. Thankfully, we were able to recover all of my data and I'm now the proud owner of one fabulous new Dell laptop!! And now for today's project! This is a tiny album that I created for a Wholly Scrap! class last week. The pages of the album are created with plastic badge holders, which were purchased at Walmart. Isn't that the coolest! You can find a tutorial on how to bind the album on Splitcoast, under the Resource section. The paper I used is from a new line from Graphic 45. This paper is so pretty that it makes me want to have another baby (it would have to be a girl!) so that I could decorate her entire room in this paper! The paper line also came with a 12x12 page of die cut tags and embellishments. One of the tags can be seen on the above pages. The design is full of fairies and woodland creatures...so sweet! Here's another peek at another tag (a scene from Peter Rabbit) and three paper brads. And since this album screamed little girl, I used a few photos of my cousins two darling baby girls. I used a few sentiments throughout the album and they're all from Papertreyink. Here's a good look at the fairy design. Darling! Once you get your pages cut for the album, the design is very simple since it's such a small page to decorate (only about 2 1/2 x 3 1/2). The biggest challenge is finding photos that are small enough to fill the pages but after a bit of resizing, I was able to get my pictures to the correct size. And don't you just love this ending photo, wonderful! Enjoy! Three words: pre-colored digis!! Love 'em, can't get enough of 'em! They are perfect for a quick and easy card!! Find lots of them at Sweet 'n Sassy!! 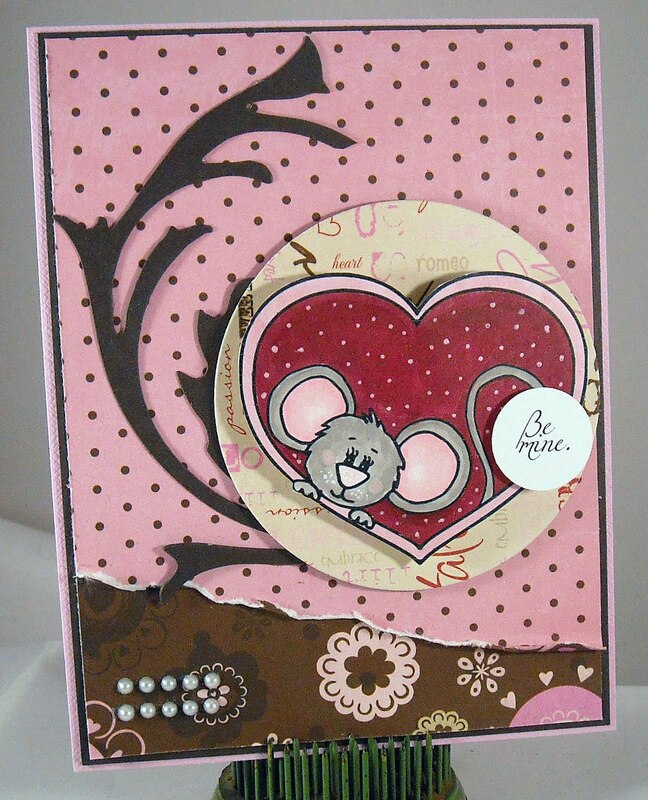 Tonight's card features a darling sketch found in an older Paper Crafts magazine. 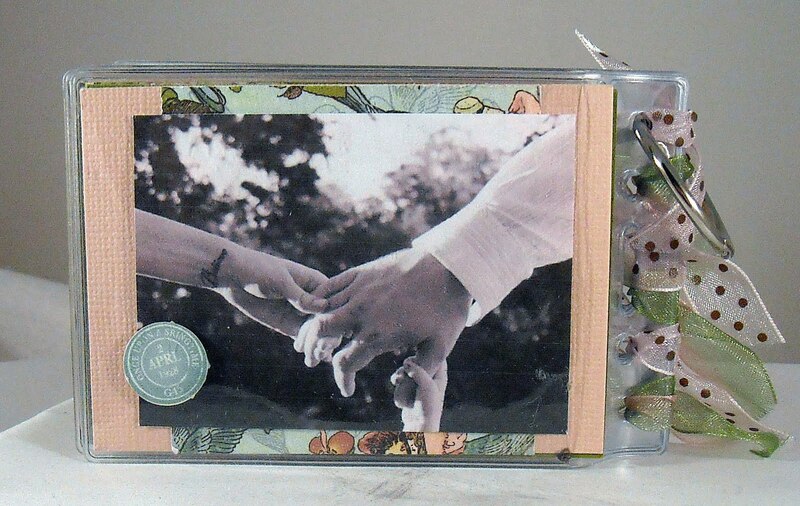 I really liked the cut out idea and how this sweet image is peeking out from inside. (Wish there was an easier way to photograph a cut out card...humm...) The designer paper is from My Minds Eye, as is the paper heart. Here's the inside of the card...just those fabulous polka dots and image! 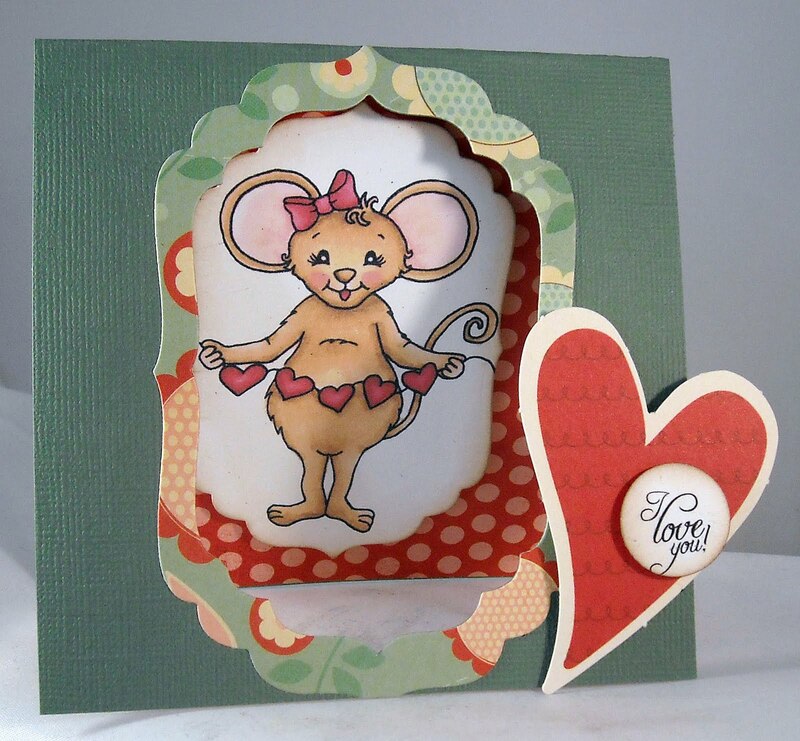 You can find the image, Melanie Mouse, here and the 'I love you' sentiment (found on the front of the card) here. Enjoy!! It's time once again for another SALT challenge and Ruth picked a fabulous topic - Truth. Please stop by the SALT blog to read her write up, which focuses on not lying and on the truth of God's Word. In general, people are uncomfortable with the idea of absolute truth, at least as it applies to Christ and the Bible. In his excellent book, "The Reason for God" Tim Keller shares this quote from someone who visited his church, "How could there be just one true faith? It's arrogant to say your religion is superior and try to convert everyone else to it." My guess is that many reading that quote would heartily shake their heads in agreement. However, Keller goes on to say that if you try to explain away all assertions of truth as one or the other or something else you will find yourself in an untenable position. C.S. Lewis in the "The Abolition of Man," states the following ...you cannot go on "explaining away" forever; you will find that you have explained explanation itself away. You cannot go on 'seeing through' things forever. The whole point of seeing through something is to see something through it. It is good that the window should be transparent, because the street or garden beyond it is opaque. How if you saw through the garden too? A wholly transparent world is an invisible world. To 'see through' all things is the same as not to see." If, for example, you say that all truth-claims about religion and God are just psychological projections to deal with your guilt and insecurity, then so is your statement. The idea that you hold to is your absolute truth. Some kind of absolute truth-claim, then, seems unavoidable. It's inconsistent to work against oppression when you refuse to admit that there is such a thing as truth. Keller's also quotes from G.K. Chesteron, "the new rebel is a skeptic, and will not trust anything...therefore he can never be really a revolutionary. For all denunciation implies a moral doctrine of some kind. Therefore the modern man in revolt has become practically useless for all purposes of revolt. By rebelling against everything he has lost the right to rebel against anything. There is a thought that stops thought. That is the only thought that ought to be stopped." So we can see that everyone holds to their own version of absolute truth. The challenge is knowing how absolute truth applies to the Bible, Christ, and Christianity. This is a huge topic and one that could fill numerous blog posts so I'll simply share a quote from Bono (the singer of U2), "...either Christ was who He said He was - the Messiah - or a complete nutcase. The idea that the entire course of civilization for over half of the globe could have its fate changed and turned upside down by a nutcase, for me that's far-fetched." The truth is that Jesus Christ, who claimed to be THE truth, the way, and the life (John 14), radically changes everything about people; who they are, how they see, and how they live. If you have ever known anyone before they became a Christian, you can testify to this fact. So either they have, in their own power, brought about such changes or absolute truth can be found in Scripture and the work of Christ on the cross. If you're unsure how to respond to these ideas, begin by praying and asking God (even if you're not sure if He exists) to give you clarity on these topics, to help you understand who He is and to show you the truth about Him. Seek God while He may be found...And may He be pleased to reveal those truths to your mind and heart. Please stop by the SALT blog to read Ruth's write up and to see the other word submitted by the design team. It might still be freezing out (yesterday was so cold it was scary!) but I know that Spring is on its way and soon we'll be enjoying the sounds of chirping birds, wide open windows, and budding trees. Not that I mind winter and the snow but this year...I just can't wait for Spring!! To welcome in those warmer days, Tiffany Doodles is releasing a brand new line of beautiful bird images on February 18. 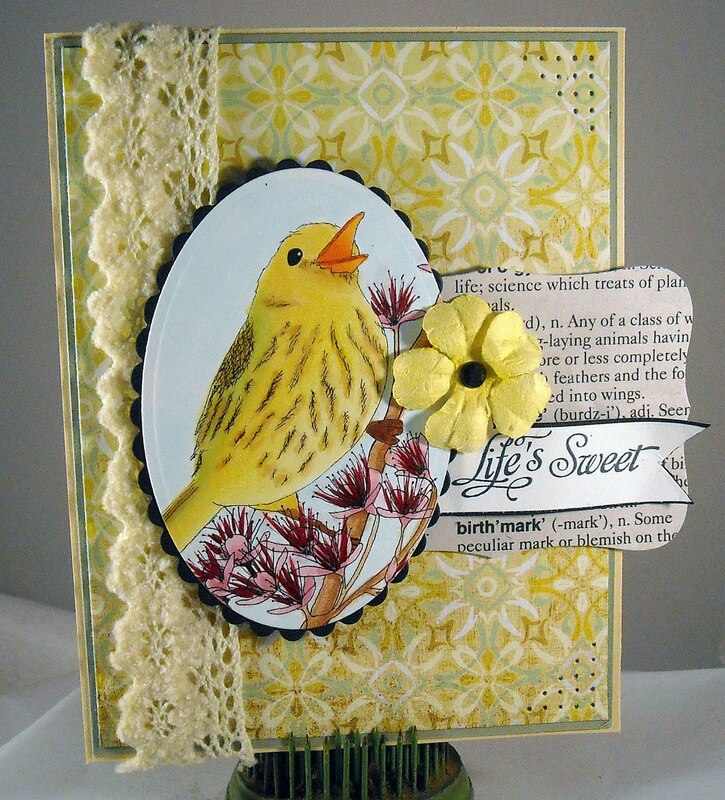 My card features the Warbler with Cherry Blossoms image and will be available for download on Friday! 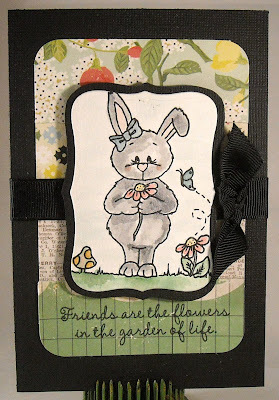 This darling image has been paired with designer paper from Basic Gray, ribbon from American Crafts, a flower from Prima, and sentiment from Sweet 'n Sassy. Enjoy and be sure to check out the Tiffany Doodles web site on Friday to see all of the new birdie releases! It's finally happened...after working part-time at Wholly Scrap! and teaching there for about five years, I've given in. I'm going to start scrapbooking! Yes, I'm insane and have no idea where I'm going to find the time but I'm going to just take it slow and work on a month at a time. My January photos, which are mostly filled with a lots of snow and children with bright red cheeks, have already been printed and my supplies are ready to go...now to work on finding that extra time... Well before I get to those January photos, I needed to create a page for work. Wholly Scrap! has a fun Kit of the Month club where customers receive a package of goodies (usually cardstock, designer paper, maybe some ribbon or embellishments) at the beginning of each month. The following month they bring back whatever they created with their package of supplies. The store always provides a sample each month, this month I had a turn to use some wonderful Cosmo Cricket paper and die cuts to create the sample page. The paper line was geared towards Valentine's Day but since I pretty much love my two little bugs more than anything in the world I decided to create a page that focused on them and used sentiments that would work for a photo of them. One of the challenges is that I needed to use only what was in the KOTM package so no extra embellies! To create my own embellishments, I made paper buttons using different size circle punches and thread. They provided a fun accent! 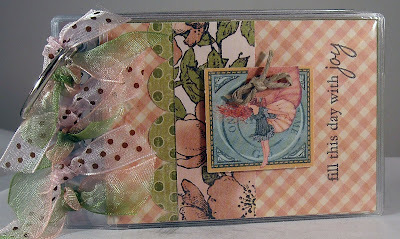 All of other supplies used on the page are from the Cosmo Cricket Hey Sugar paper line. Enjoy and if you live in the New England area (ME, MA, NH) stop by Wholly Scrap! and find out the details of the KOTM Club! Happy Valentine's Day! What am I going to do with myself now that V-Day will be over by tomorrow? I'll have to find other love-inspired images to pair with my plentiful stash of love-inspired designer papers that are still in my paper pile!! In addition to the celebration of Valentine's Day...we're also celebrating that Sweet 'n Sassy released a bunch of lovely new digis on Friday. You can see them all here. My card, which was given to the youngest sweetheart in my house this morning, features the Bethany Sends Her Love digi image...isn't she adorable! My background paper, which has been dry embossed with a swirl embossing folder, is from Cosmo Cricket, ribbon is from Papertreyink. A simple layout, featuring a big 'ol scalloped circle, which I embellished with white gel polka dots. Enjoy! I'm postponing the Keep it Simple post this week to share a darling award that I received from a new blog reader, Grace Baxter. Grace wanted to share a list of folks whose blogs she enjoyed and I was overjoyed to receive one of her first awards! Thank you so much Grace! 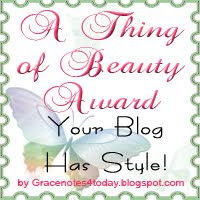 So...now it's my turn to list five stylin' blogs to earn the next round of awards! Here are my picks, in no particular order: (Not only do each of these blogs carry an adorable design but the artwork found on each is amazing!) 1) Poppy Paperie (Lisa Johnson) - Swirls, flowers, and different size fonts...My three favorite things all in one place! 2) Stamping Mathilda (Godelieve Tijskens) - I love how she uses her stamped creations in her custom banners. 3) Stamping a Latte (Jodi Collins) - A cafe, a latte, a laptop...what's not to love! 4) Inspired By (Jill Foster) - A perfectly wonderful CAS blog. 5) Day by Day (Melissa Goodsell) - I love that she uses photos of her family and her craftiness in her banner. And now I'm supposed to share five things about myself...humm....there's not that much that is very interesting but here goes... 1) I'm the proud owner of eight chickens (and recipient of many farm fresh eggs!) 2) I homeschool my two children (and I love it!!) 3) I work P/T and teach monthly classes at a scrapbook store (and I love that too!!) 4) I used to travel extensively for work...on the road about 50% of the year. 5) For the first time in my life I am the proud owner of a seven-year old, big 'ol, very handsome tabby cat (and against all odds...I love him) Oh yeah, and one thing I love about crafting...It's the friendships that have been created and the joy of being in a wonderful industry, full of wonderful people! Want to highlight some of your favorite blogs? Grad the badge and share the love! Welcome to the very first Sweet 'n Sassy customer blog hop, which will now be held on a monthly basis! 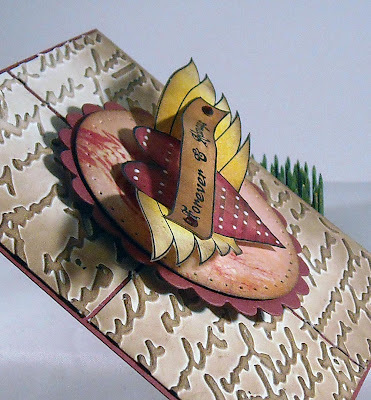 To celebrate the arrival of Valentine's Day, our first blog hop is titled 'Love is in the Air.' You can grab the badge here to help us spread the word! Today I'm showcasing the ever popular Cocoa, peeking out from inside a giant love-filled heart. 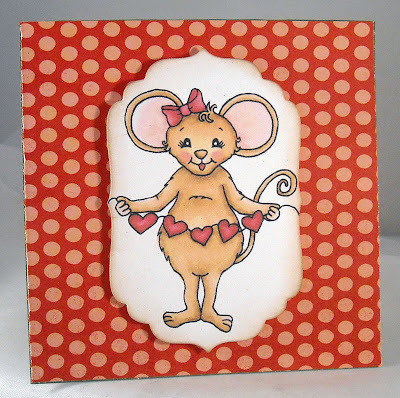 My digi image, Cocoas Heart, is the perfect image for a Valentine's Day card and it can be downloaded from the Sweet 'n Sassy web site for only $3.00...Swoon... My image has been paired with love-inspired paper from Bo Bunny. The papers on my card are from just one double-sided piece. I 'tore' away a section of the polka dot paper to reveal the heart paper underneath. The word circle paper under Cocoa is from the Bo Bunny same line. The big 'ol swirl is a die cut from Tim Holtz and the sentiment is from the Valentine's Day Digi Greetings set. And I confess that once I colored the heart and Cocoa with my Copics I added some white gel pen polka dots...one can never have too many polka dots on a card! Oh, and the tiny pearls are from Kaiser Craft. And now for the blog hop details! IMPORTANT BLOG HOP DETAILS:~ ~A Linky Tool is posted on the SNSS blog, where participating bloggers may add a link to their appropriate blog post. Links may be added between 9am EST Friday, February 11th and 9pm EST Sunday, February 13th. 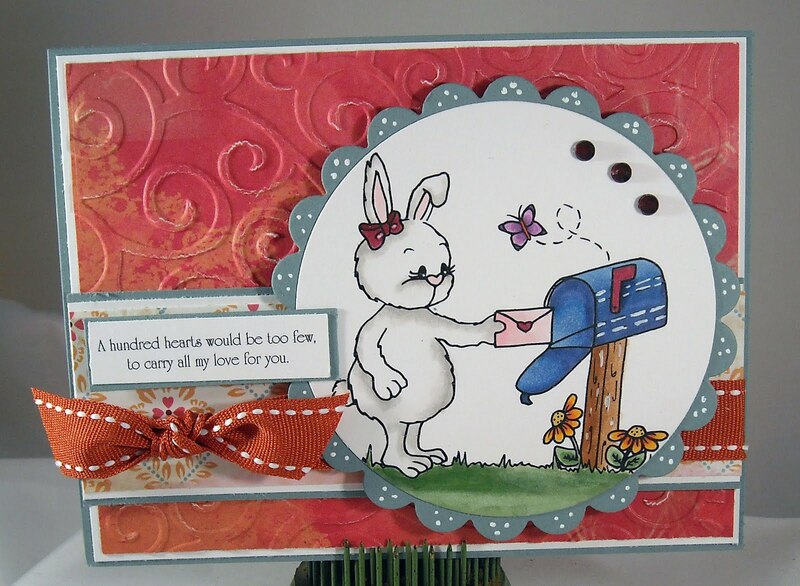 Bloggers may then hop from blog to blog throughout the weekend to see all of the fabulous "Love is in the Air" themed SNSS creations. ~ALL blog hop participants (those who participate in the hop as bloggers, NOT just hoppers) will receive a FREE digi stamp! ~Participating bloggers MUST post a project on their personal blogs featuring SNSS images/sentiments as well as the "Love is in the Air" theme in order to participate in the hop. 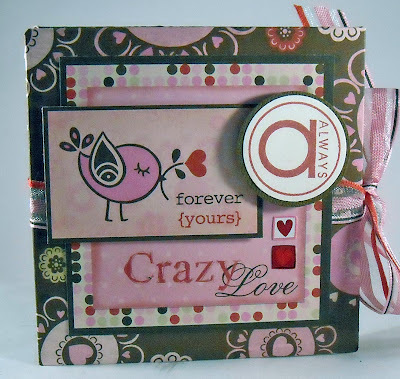 ~A grand prize of a $25 shopping spree to Sweet 'n Sassy Stamps will be randomly drawn from blog hop participants and announced on the SNSS blog on Monday, February 14th. Head on over to the SNSS Blog to add your link or read more about the hop...it's going to be a love boat full of fun!! Thanks so much for shopping by to visit!! So a few weeks ago Korin sent the DT team a little girl digi stamp, Molly Loves Reading, and I responded that I loved it but...did she have any plans to create a little boy reading image 'cause this Mama lives with two sweet little boys. Not 24 hours later and this darling image arrived in my email in box! How wonderful is that and how wonderful that Korin created an image that reminded me so much of my darling oldest son. Swoon... The name of this image is Jacob Loves Reading and even though the image is named Jacob I made sure, using my Copic markers, to make him look like a Carter. 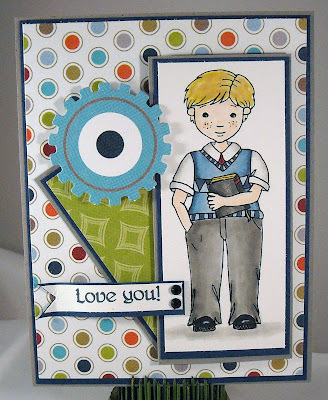 :-) I paired the image with little boy paper from My Minds Eye; this line is actually called Robots (it includes darling paper covered in robots!) The chipboard gear, located in the upper left hand side of the card, was included with the paper kit. 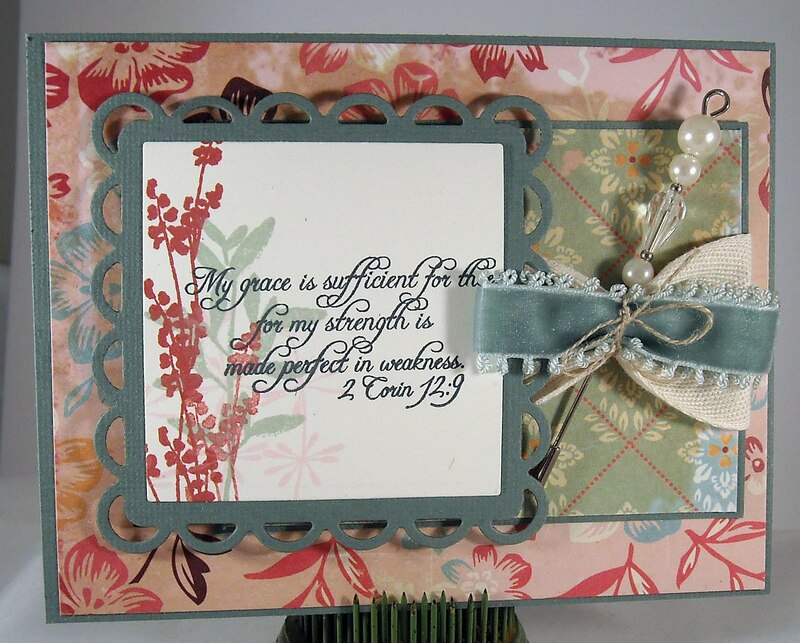 The sentiment is also from Sweet 'n Sassy, from the Gifts from Turtle stamp set. Enjoy! I'm excited to share the details about a weekend long stamping event that is being hosted by Wholly Scrap! (The store where I teach!) We held a Stamping Around event last year and it was a blast! You can read about last year's event here. The event will be held on March 4-5, 2011 and the cost for the entire weekend is $150, which includes the following: -Five stamping classes, taught by some of the industries biggest and brightest instructors, designers, and bloggers (This year we have Jodi Collins, Erika Martin, Cindy Lawrence, Julie Masse, and Melissa Bickford) -Snacks and drinks on Friday evening -Snacks and lunch on Saturday -An opportunity to win stamping products and supplies -Fun, laughter, and friendships to last a lifetime For additional details on this event, please visit the Stamping Around web site. The registration link can be found on the left hand side of the site. Space is limited, with half of our seats already being sold, so please register asap! It's the 7th and that means it's time for our Tiffany Doodles monthly challenge! This month, being just a week away from Valentines Day, it's all about love!! Our challenge for this month is to create a love-themed card or project. Ohhh la la... My card features two digi images; one from the Heart Wings set and the Love Banners set. Note that both of these images are part of a set, which means you'll receive multiple images for one price. Yeah!! I confess that when I saw the heart wings image I thought of an old time tattoo, especially when I imagined the banner across the front of the heart. That meant I had to go with a nice vintage look and I got that adding walnut stain Distress Ink on the embossed panels as well as on my printed and colored digi images. Today's Tip: When in a rush, go with a tried and true layout! OK, I confess...I've used this layout before...but...it works! Late last week Sweet 'n Sassy released the February stamp sets and we had an awesome release party on the SNSS forum at Christian Paper Crafts. You can find the forum here, why not sign up to be a fan so you can join us at the next party! A release party consists of lots of fun chit chat, revealing of the new stamp sets, specials, and challenges. One of the challenge for this month's party was to create a CAS (Clean and Simple) card the featured the colors white and red. I used this darling new image from the Let it Rain set, colored my girl's dress red and popped her up on a polka dot embossed background. How simple is that?! And now for this week's news....On 2/7 I'll be posting the new Tiffany Doodles challenge, complete with new rules and even better prizes! 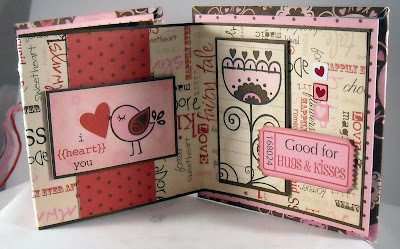 On 2/9, I'll have a post on the new Sweet 'n Sassy stamp blog, and on 2/11, the SNSS DT will be hosting a "Love is in the Air" blog hop!! (Click on the badge on the right hand side for more details...) So...it's going to be a busy but super fun week; check back often!! Have you guys seen the amazing contest that Nichole is holding on her blog? A prize of over $700 in fabulous Papertreyink products!! Fantastic! You can read about the rules and how to enter here. One way to enter is to post your favorite product from 2010, using PTI stamps. First things first, I realized that I didn't purchase enough PTI stamp sets in 2010! LOL! On to more shopping in 2011! And second, this is by far one of my favorite stamp sets from PTI, Through the Trees. I used this stamp set numerous times last year but this is my favorite project, a card I created for a SALT DT challenge. I used a direct to paper technique for this project; sweeping my ink pads across the paper to create the background. I also used the rock 'n roll technique for the tree leaves so I could have two greens on the leaf image. 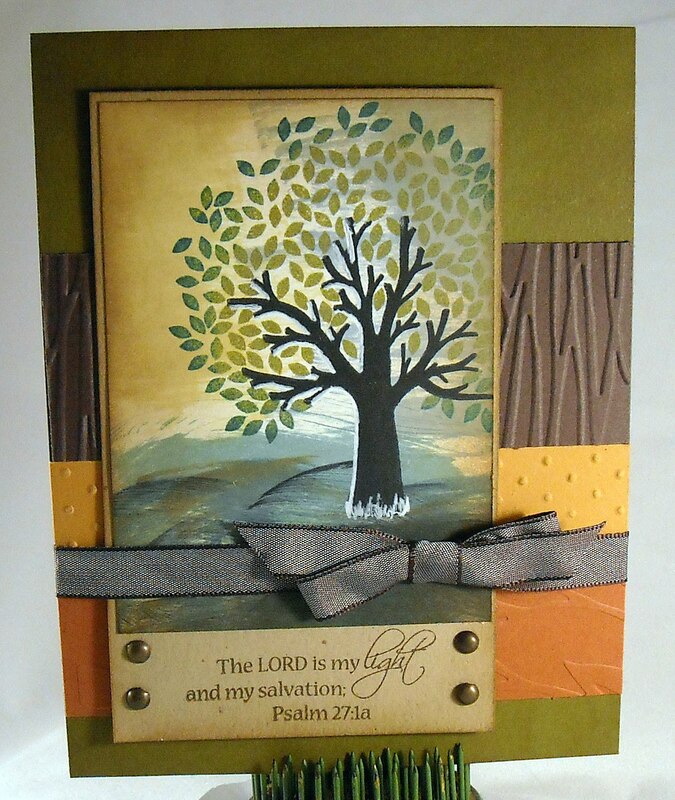 The background is a combination of a few strips of dry embossed cardstock. The sentiment is from Sweet 'n Sassy. Stop by Nichole's blog to read all about the contest and to enter!! Enjoy! Another class card today! 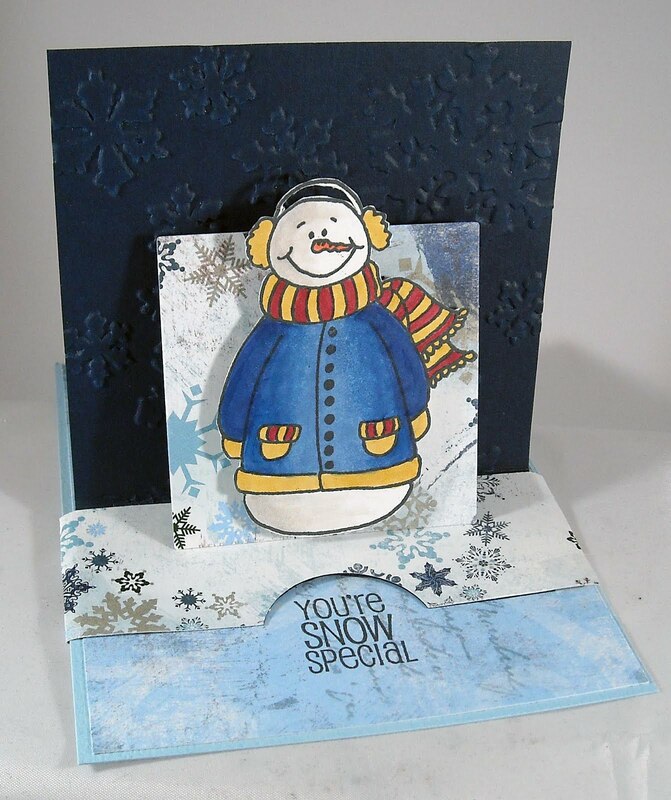 This one is a pop-up card and just perfect to show off this darling snowman image from Sweet 'n Sassy. This image, and sentiment, is from the Snow Special stamp set that released last month. The background of the card (behind the snowman) was embossed with a Tim Holtz snowflake embossing folder. The image was colored with Copics and the designer paper is a new line from Bo Bunny. You can find the directions for how to create a pop-up on Splitcoast....or you can attend my class next Friday at Wholly Scrap! Contact the store for details! Enjoy! It's time for another SALT challenge and this week it was Pauline's turn to set the challenge and she chose "love your enemies." You can read her write up on the SALT blog. I confess that I'm posting this just this morning vs. last night and therefore haven't had much time to think through a detailed post. However, I will share that I chose my Scripture verse based upon what is needed for us to truly love our enemies...God's grace. It is not natural for us to love our enemies or those who mock us or our beliefs or who dislike us for no apparant reason. It's natural for us to either seek revenge or to fight for our own reputation, to want to come out of the corner ready for a fight. Yet Christ commands us to love those who don't love us and pray for those who hate us. And what Christ commands He did Himself. For as he hung upon the cross, he prayed for his crucifiers, who were then used Him in the most despiteful, as well as cruel manner; saying, "Father, forgive them, for they know not what they do." Matthew Henry has this to say on loving your enemies and a Christian's duty, "The Jewish teachers by neighbour understood only those who were of their own country, nation, and religion, whom they were pleased to look upon as their friends. The Lord Jesus teaches that we must do all the real kindness we can to all, especially to their souls. We must pray for them. While many will render good for good, we must render good for evil; and this will speak a nobler principle than most men act by. Others salute their brethren, and embrace those of their own party, and way, and opinion, but we must not so confine our respect. It is the duty of Christians to desire, and aim at, and press towards perfection in grace and holiness. And therein we must study to conform ourselves to the example of our heavenly Father. Surely more is to be expected from the followers of Christ than from others; surely more will be found in them than in others. Let us beg of God to enable us to prove ourselves his children." That leads me to the verse that I used on my card for how can the natural man really care about and truly love those who are unlovely in their conduct and words? Only by the grace of God, who is able to transform our hearts. We are weak in our own strength, unable to do this grand thing that Christ commands. But it is in our own weakness that we can take courage, for there must be a consciousness of weakness before we can have victory. May God be pleased to grant us grace to love our enemies and to pray for those who use us for He may be pleased to use our conduct to touch their hearts. As the centurion said as he gazed upon Christ on the cross, his heart obviously changed by all that had happened that day, "Truly, this was the Son of God." Please stop by the SALT blog to see the other lovely works created by the design team and feel free to create a project based on this week's challenge. We'd love to share in your work!! PS - OK...don't laugh because it appears I rarely have nothing to say...so much for being unprepared! LOL! Morning bloggers! Let's see a show of hands of who is snowed or iced in this morning? :-) Wow! Talk about snow this winter...I think this might be the most snow I've seen since moving to New England 12 years ago. I'm so thankful that my entire family is snug in our home today, hanging in our PJ's, and hopefully crafting later! 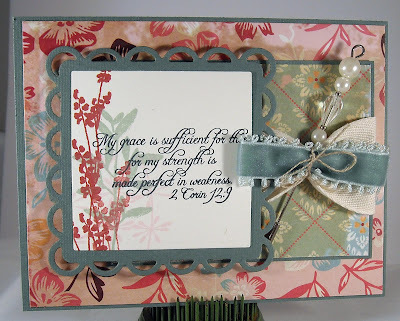 Today, I'm sharing a project that I'll be demonstrating at an upcoming class at Wholly Scrap! This is our monthly PMS Class (that would be Pizza, Music, and Stamping) and next week it's going to be all about winter and love. 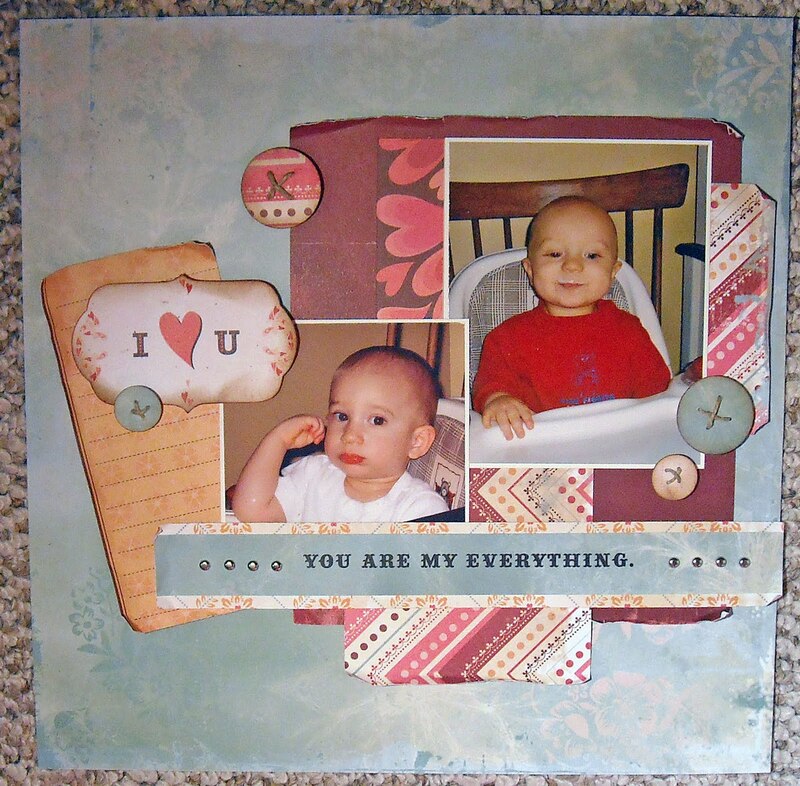 This darling project is from a tutorial that I found on Splitcoast (my favorite place for all things crafty!) The covers of the card, which measured 4.25" x 4.25", are cardboard pieces that have been covered with love-inspired paper from Bo Bunny. Once the ribbon is untied, the card folds out to four panels, created by taping together a few pieces of scored cardstock (designer paper is layered on the cardstock). And now you have four little panels that are perfect for decorating. Here's a close up of the left side and I confess that I didn't really stamp a darn thing on this project! This Bo Bunny paper line came with two pages of paper embellies and cut outs that were just perfect for decorating. On the left side I added a small pocket that I stuffed with tickets. And the other panel has a Nestibilities scalloped frame, created by placing a plain oval die inside a scalloped oval and running through the Big Shot. 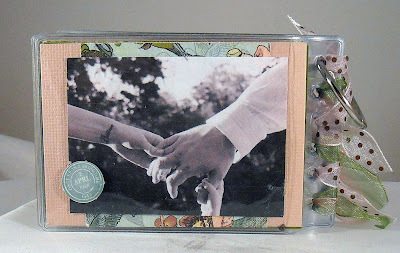 A tiny picture of a bird and flower filled the frame and a 'love' sentiment was punched from the DT and adhered with foam tape. The right side went a bit faster as I simply cut out a few of the decorative panels from the paper and added it to the card with foam tape. I also added a few heart stickers here and there throughout the album. It was really an easy project, especially when I was using the paper for embellishments. This paper was so much fun I just couldn't bring myself to add anything else to it! :-) Enjoy and hope everyone is warm, safe, and cozy today! And if you're in the NH area, contact Wholly Scrap! about my upcoming classes!